In 2018 the New York Yankees (78-46) are bashing their way to the win column game after game at a potentially historic pace. Entering play on August 21 the Bronx Bombers have already slugged a major league-leading 202 home runs and are on track to tie the mark of 264 homers set by 1997 Seattle Mariners that featured the likes of Alex Rodriguez, Edgar Martinez, Paul Sorrento, Ken Griffey Jr. and Jay Buhner. The Yankees long balls are in particular coming from five players that have bashed at least 20 homers each, which marks only the second time that’s been done in franchise history. The 2001 World Series-winning team of 2009 finished the year with seven hitters of 20 or more home runs. 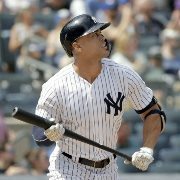 This year left fielder Giancarlo Stanton (32), right fielder Aaron Judge (26), shortstop Didi Gregorius (22), third baseman Miguel Andujar (20) and center fielder Aaron Hicks (20) have accomplished this feat, while Gleyber Torres (who hasn’t homered since August 6) is poised to join the select club soon as he stands at 18. Also, with the injured Gary Sanchez expected to return to the starting lineup within two weeks, he could soon join this elite club. Although he stands at 14 home runs so far in 2018, the 20-homer plateau is easily within his reach as well. It’s no secret that the Yankees lineup is built around the long ball and the Yankees have so far delivered on that promise. However, the main problem for the Yankees so far has been the nagging injury issues of their roster. In that regard, the latest setback to the Yankees is the injury suffered on Monday by Gregorius as he suffered a left heel contusion and as a result, was placed on the 10-day disabled list. Gregorius injury was made worse this week when the Yankees found out that Judge, who was expected to miss three weeks with a wrist fracture, is far behind his original timetable and it still isn’t clear when he will return to the starting lineup. Other players that are currently on the disabled list include outfielders Jacoby Ellsbury and Clint Frazier, and left-handed pitcher CC Sabathia.